In a talk at Z Media Institute 2010, Noam Chomsky begins by comparing the similarity between the U.S. founding mission to be an empire of the chosen, with Israel’s mission. He cites the U.S. self-proclaimed “humanitarian mission” to help the native population by exterminating or removing it. He then talks of the manifest destiny, its preference for settler colonialism, which he calls the most savage kind of imperialism, and the importance of the Mideast in establishing U.S. world dominance. 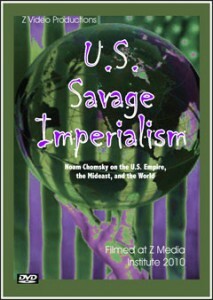 DVD includes talk (65 minutes) and Q&A on the environment, activism, and other topics (56 minutes).